EmDrive is currently one of the most controversial theories in science. It created buzz among scholars after the hypothetical new type of aircraft engine seemed to break the laws of physics. Some scientists threw skepticism, while others conducted tests to prove, and some of these experiments seem to indicate that the EmDrive could actually be possible. 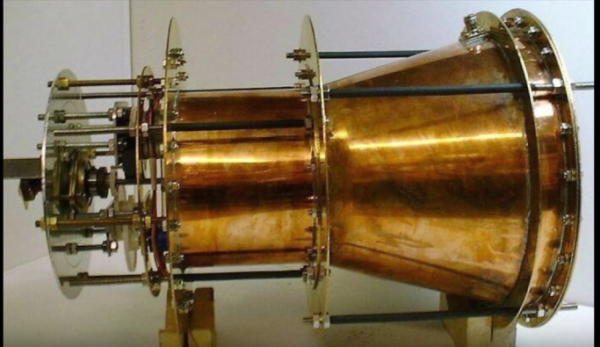 But what exactly is EmDrive and how could it be breaking the laws of physics? According to PBS Space Time, the EmDrive, invented by Roger Shawyer, is a large, tapered metal cylinder that is closed on both ends. And inside the cylinder, microwaves that bounce back and forth are generated. Although the design looks simple, it actually seems to produce a small amount of thrust. In fact, a NASA team of researchers found that it could produce about 1 newton of thrust for every megawatt of power they pumped into, making the EmDrive as efficient as those ion drives used on long-range spacecraft. However, while conventional ion drive uses propellant, EmDrive does not use any. This thus violates several existing physical laws such as the conservation of momentum and causes controversy among experts. Based on the experiments conducted, NASA researchers attempt to explain the science behind EmDrive as an effect of internal vibration, heat distortion, or even Unruh radiation. But scientists suggest that the answer could actually lie on the mysterious interpretation of quantum mechanics called pilot wave theory, Popular Mechanics reported. They argued that the pilot wave theory is not only applicable for quantum theory as the pilot waves are also a result of background quantum fluctuations called zero point energy. The pilot waves could allow the drive to tap into the vacuum energy of the Universe, Forbes noted. Researchers suggest that if the pilot wave model is true, then the theory that EmDrive could be pushed against a vacuum of space itself and generate its own thrust seem be possible. However, this is not as easy as it seems as the explanation also faces several tough questions including the fact if the pilot wave theory is actually true. And even if it is true, it may not be enough to back or explain EmDrive.